When Caleb Lightbourn committed to Nebraska, the plan was to redshirt and take the year to study under one of the best punters in the country. However, with Sam Foltz’s tragic passing, the plan changed and Lightbourn was thrown into the fire right away. The 6-foot-3, 220-pound freshman from Washougal, Washington, struggled mightily through his first two collegiate games. His punt logs are as follows: 29 yards, blocked punt, 43 yards, 36 yards, 37 yards, 23 yards, 27 yards, failed run attempt, 44 yards. With the No. 22 Oregon Ducks in town on Saturday, the Huskers couldn’t afford to have that kind of production from the punt unit. They needed more from Lightbourn, and to his credit, he stepped up to the plate and delivered much more. Lightbourn’s first two punts were the best of his career to that point, with each traveling 46 yards without a return thanks to a friendly bounce. His third punt only traveled 38 yards, but the coverage unit downed the ball at the 17-yard line. On his fourth attempt, Lightbourn pushed his personal best even higher with a 48-yard beauty that was downed at the 3-yard line, and on his final opportunity he blew his previous punts out of the water with a 58-yard bomb that was only returned 5 yards. "I thought he just got better as the game went on,” Coach Mike Riley said. “I think everybody got a glimpse of the ability of Caleb today." Riley was spot on. Each punt was more impressive than the one that preceded it, and with each boot you could almost see Lightbourn’s confidence rising. Gone was the player that struggled to find the balance between distance and hang time, and in his place was a young man that looked confident, carefree and, yes, almost Foltz-like. The Huskers won the field position battle against the Ducks, and Lightbourn was the primary reason for that. On Saturday, Caleb Lightbourn turned what had been perhaps Nebraska’s greatest weakness into one of its biggest strengths. Tommy Armstrong is resilient. I've felt that way about the senior quarterback for some time now. He has an incredible ability to let the hate and scrutiny he receives just roll off his back. It's an admirable trait. That doesn't mean he's without flaws. He still throws off his back foot, he still makes questionable decisions and he still stares down his receiver more often than not. He's frustrating. On the reverse, he doesn't doubt himself. If there is one kid who takes a hit and bounces right back up, it's Armstrong. "Tommy Armstrong is awesome," defensive coordinator Mark Banker said. "You know, whatever, all the up and down stuff, whether it's his passing or decisions or whatever. If I know one thing, the dude's got a heart of a lion and you can't take that away from him. He's an awesome competitor." Yes, Armstrong is an awesome competitor. Against Oregon, he surpassed former Nebraska quarterback Taylor Martinez's career passing yards record. It had previously been set at 7,258 (and Armstrong is only three games into his senior season). He's not a captain, but he doesn't worry about it. He lives by the mantra that "captains are chosen, leaders are born." His teammates seem to agree. "Ever since I have been here I have respected the hell out of Tommy," safety Nathan Gerry said. "Tommy is one of the toughest dudes I know. I have never seen him get knocked down and not get back up. This whole team respects Tommy for him as a ball player, we love him for it." Armstrong isn't perfect. He has his flaws, but he's resilient. Against Oregon, that resiliency paid off. The night before the Huskers faced the Ducks in Lincoln, Nebraska offensive coordinator Danny Langsdorf told Bryan Reimers' mom, Suzanne, that they had some plays for the sophomore wide receiver on Saturday. When you make a promise to mom, it's best to keep it. And Langsdorf did, dialing up the Lincoln East product's number to end the Huskers' first drive of the second half. It was a powerful drive -- a statement of second-half intent -- that featured six power runs before Langsdorf sent in the call for a play-action pass from the Oregon 22. Tommy Armstrong Jr. threw a little high to Reimers down the sideline, but it's hard to throw too high for the 6-foot-5 Reimers. He lept, made the catch and held on through a tough hit from the Ducks' late-arriving safety. "It was a wonderful play," Langsdorf said. "He got himself through a press coverage. He was the first throw on that play and it took him a little longer to get through, but he came out of it nicely and made a beautiful catch." "I was just running my route, doing what I do, and you never know what’s going to get thrown to you," Reimers said. "You’ve got to be ready to make the play that’s there. "I went up and knew I was going to get hit some way, some how, and just braced myself for it, came down with it and scored." 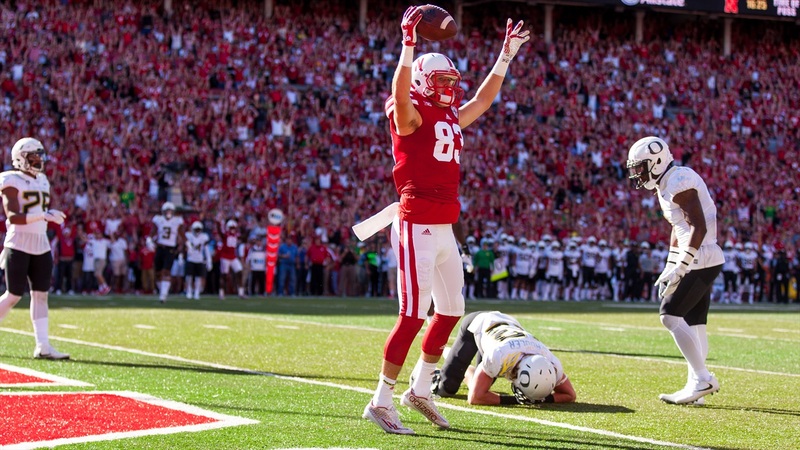 It was Reimers' first career catch and thus the first one most Husker fans had seen from him, but it was nothing new to the Nebraska team and staff. "He’s a tough kid," Langsdorf said. "He’s got great range. He makes those plays in practice." New England Patriots' defensive tackle and former Husker Vincent Valentine sold it a little harder.